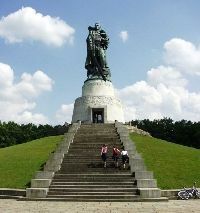 The Treptow district in south Berlin is a favourite with walkers with its extensive Treptower Volkspark (citizens park), created in 1877 in the style of a formal English garden with an arificial lake. The rose garden and the fountain are well worth seeing. The park also plays host to the famous Soviet Memorial, where 5,000 Soviet soldiers are buried. The memorial sculpture is of a soldier protecting a child with one arm and holding a sword in the other. The memorial faces the newly built Treptowers business centre. Albert Einstein made scientific history at the local Archenhold observatory with its 21-metre telescope (the worlds longest) when he presented his relativity theory to the public here in 1915. Berlin's sightseeing boats make a stop at the local Treptower Hafen, a restored port that operates from March to October. Treptow is well served by the overground network (S3, S41/42 ring train, S6, S8 and S9). Regional trains stop at Schneweide station and Schnefeld airport is just beyond the city limits.